Demonstrates how area changes with distance and that the intensity of light, gravity, and all forces decrease with distance. Are your physics students meeting with the success you expect? Actually 22.4 L in size, Fully Labelled, and Washable. A daily science trivia series. This novel protractor template allows you to make your own protractors with your school name and/or department printed right on them. These may be given or sold to your students. One template has 8 regular size protractors. 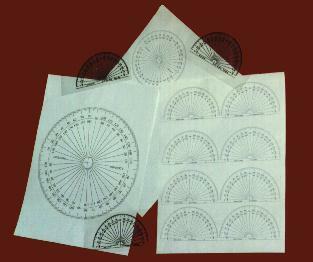 Ideal for refraction & reflection experiments, geometry, class sets for tests & exams. The students love them because they are flexible and fit into their wallets. They will never come to a test or class without one again! On the second template a circular 360° full page in size protractor, for doing experiments such as refraction of light through a semi-circular dish. On the third, four smaller 360° ones. State, with your order, printing instructions. 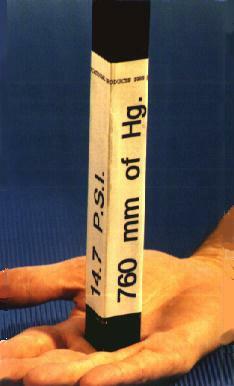 This painted and fully labelled steel bar has a mass of 14.7 lbs and has a cross-sectional area of 1 square inch corresponding to air pressure in the British system. The tremendous force of atmospheric air pressure is demonstrated by allowing the student to actually hold the bar. They are invariably surprised and gain a new sense of appreciation for air pressure. Each side of the bar has one of the following labels: 101.3 kPa, 14.7 PSI, 760 mm of Hg one atmosphere. "The kids find it amazing....you have to try it yourself to believe it" S. B. - London Ont. An exceptional way to demonstrate the Inverse Square law and its ramifications Four rays of light, simulated by strings, leave a point source undergoing rectilinear propagation. They form 3, equidistant to each other, but different in size areas. As the light spreads one, two and then three distances away from the light source, the rays subtend the first plane of one unit of area. The second plane, at two distances away, is four units of area in size and the third is nine. The area, over which the rays spread, is clearly visible on 3 clear, appropriately marked, sheets of Plexiglas. Each show the correct number of unit areas. 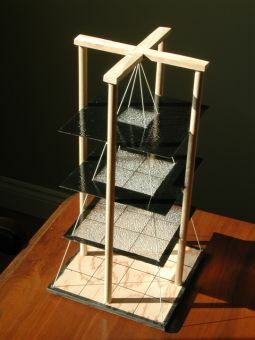 The INVERSE SQUARE LAW DEMONSTRATORTM shows the student clearly that as light travels, it spreads over larger and larger areas proportional to the distance squared. This clearly illustrates why the intensity of the light, and forces like gravitational and electric, vary inversely with the square of the distance. The apparatus is approximately 40 X 20 X 20 cm, large enough for everyone in the room to easily see. The worksheets in the book are designed to be done before the problems in the text. The students find them easier because the approach is different. The raw data is given to them so they face the physics concepts and not the jargon. This minimizes the threat inherent in word problems. These drill type questions, few of which are in texts, usually contain one concept. That concept is reinforced and enhanced in following questions. Because they learn progressive simple concepts, they are encouraged to do more. The result, they have more success with the problems in the text and do more of them. The books comes complete with answers and cross-references to their text. The authors have a combined total of over 60 years experience in physics and have had great success in their use. The questions have been tested for years and best of all the method works! This success is measured by higher class averages and increased physics enrollment. 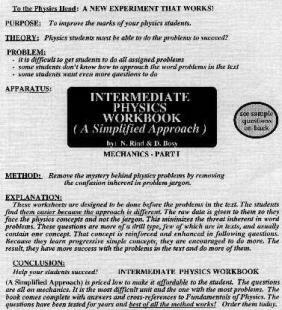 The Intermediate Physics workbooks are priced low to make them affordable. You may ask your students to purchase these workbooks outright with their own money, or if you have the money in your budget, buy them for them. Some schools have sold the books to the students and if they do not write in them, buy them back. This way, at least, you give them a choice. Which ever way you choose, the student's MARKS WILL GO UP. "I found that the questions helped me understand the problems in the textbook." "It clarified problems I had when I was reading the textbook." "The questions go from easy to difficult so I can then go gradually to hard ones." "The questions were less confusing than those in the text." 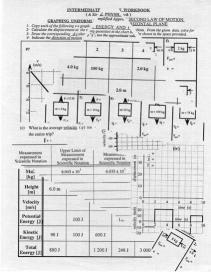 "It help us to understand the physics concepts easier." "It helped me to improve my problem skills." "I liked how there were a lot of questions so that we could practice more on parts we're not good at." "I liked that it helped out a lot with the mathematical parts of the course." "It had many examples that I tried and by solving these I was able to understand the tests a lot more." "It gave a wide variety of problems that were more straight forward that the textbook." RAY BOX ACCESSORIES & REPLACEMENT PARTS RAY BOX REPLACEMENT METAL CASE Replacement for the outside plastic case of your old ray boxes. These cases melt and crack due to the heat produced by the bulb. Why spend over $100 for a new ray box. Replace the old case with a new metal one. The metal case radiates heat better and will never melt, crack or break. No. 7 in photo above. ADJUSTABLE PLANE MIRROR HOLDER This metal holder allows the student to keep the mirror flat to the table top while at the same time allowing the mirror to be angled to ensure that all reflections are along the table surface. This makes the incident and the reflected rays readily observable. No. 8 in photo across. PLANE MIRROR This 150 X 40 X 2.5 mm mirror is designed to fit in the plane mirror holder above. It is coated with 8 layers of reflective surface for maximum reflection. The edges are hand polished to insure that edges are smooth so that students can't cut themselves on any sharp edges. No. 9 in photo across. METAL REPLACEMENT SLIT PLATE These slit plates are hand crafted out of shiny metal so they will neither break nor melt from the heat of the ray box. The slits are made deeper and wider than those of other manufacturers to allow more light to get through. No. 10 in photo above. The side with the blank line emphasizes that this concept is so universal it applies to any molecular substance as a gas. It is hand made from white melamine coated sturdy wood with bold black lettering on clear fully washable plastic. 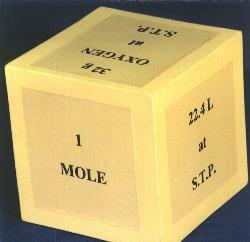 It is approximately a 28 cm square. These interest grabbers, add interest to your class. They come one to a page, ready for daily posting. Stimulate your students into discussion and even argument over fascinating science trivia. Your student's interest in science will grow daily. They will look forward to the daily question and the classroom discussion generated! The answers, many with additional information, are on the bottom of the page in tiny print. Each set is a one year supply of daily trivia questions and comes on coloured patterned quality paper for posting. Choose biology, chemistry, physics sets or order all three for your department. Don't forget to state you subject preferences when ordering. To get the answer click on the question. What is the only man-made structure that can be seen with the unaided eye, from space? How many kilometres of nerves are there in the adult human body? In the U.S.A. what was the first thing made from plastic? Catalogue no: 91P014 $ 29.95 per set. "It generated a lot of interest in my classes and the students looked foreword to them. So did I!"